As innkeepers of this Napa Bed and Breakfast Hotel, one of our greatest pleasures is seeing, smelling and hearing the change of seasons in the Napa Valley. The green of the valley is breathtaking. The smells of the blossoms are everywhere. And, perhaps our favorite, the sweet song of newly hatched birds during the day is a perfect backdrop for the coming of spring. The overall weather pattern changed from the cooler days of winter: Rains continue, but things get warmer. We see more sunny days. 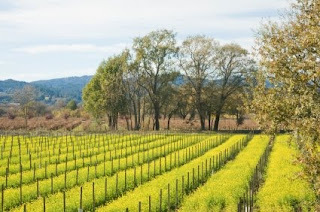 Mustard plants between the vines inject a vivid golden yellow everywhere. And the grape vines begin to wake up from their dormant winter slumber. Napa Valley wineries get busy "caning" the vines (pruning them back) while they're still dormant, and get ready to plant new vines once the weather/time is right. This is also a time when some Napa wineries begin bottling their precious nectar, removing the wine from the barrels and transferring it into bottles. After bottling, the bottles are "put down" for a bit, to let them rest and recover from "Bottle Shock" (and you thought this was just a cute name for a movie!). Bottle shock can last anywhere from a few days to several weeks. Soon, the leaves will start to appear, and after that-- bud break. March and April are lovely, and a perfect time to visit the Napa Valley. 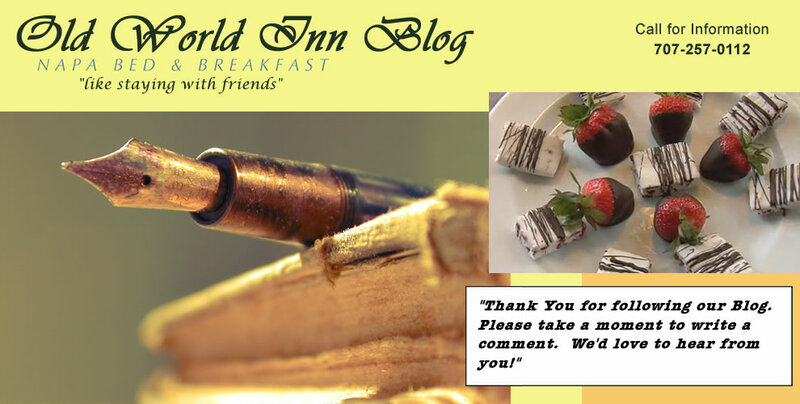 If you've never stayed at a Napa Valley B and B, why not give it a try? The environment feels more homey, and insider advice from local innkeepers is a great way to discover your new favorite wine, or restaurant!